AmericaSpace wrote: And because of the angle of the approach trajectory, Ceres will not be very illuminated until the end of April when Dawn reaches its initial science altitude orbit of about 8,400 miles (13,500 kilometers). Dawn’s next imaging session is scheduled for early March, but likely won’t reveal much more. “The next images will be a little bit better. But the resolution doesn’t get much better until late April!” Russell explained. As the white spots go, were I a conspiracy type person ( which i am certainly not ) I'd have thrown the book at this one. Imagine they are all up in arms over over this ??? 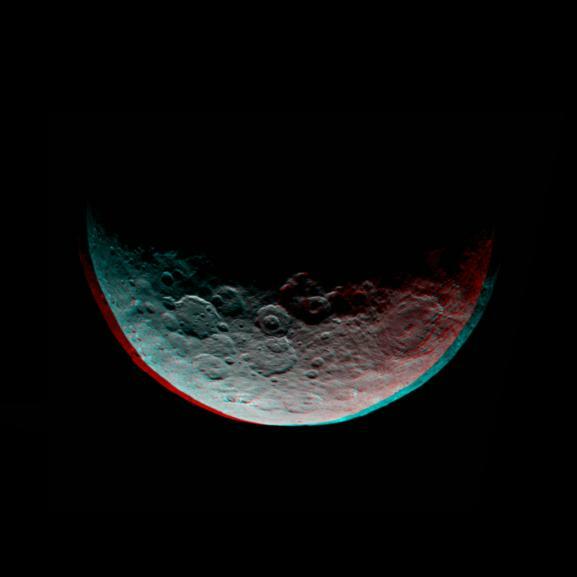 Dawn Maps Ceres in False Color (S&T, Camille M. Carlisle) wrote: The color scheme in this map is inverted from reality: the version JPL released assigns the short, bluer wavelengths to be red, and the long, infrared wavelengths (which the human eye can't see) to be blue. That seemed a wee daffy to me, so I asked what was up. Turns out the camera team wanted the map to look unreal: it's too early in the mission to unambiguously separate all the things that influence the surface's apparent color, and when the team made a map with a different color scheme, it led to misleading interpretations even among the team's own members. So instead they decided to emphasize the "false" in false-color and forestall confusion. Here is the image uninverted. Is it because blue makes people think of ice? geckzilla wrote: Here is the image uninverted. Is it because blue makes people think of ice? I think there's a lot of value to selecting false color schemes that shift images from anything approaching "natural" colors (not just with planetary images, but also deep sky images, where I frequently prefer to avoid seeing efforts at "real" color). Your observation about ice may or may not be accurate, but it illustrates the point that we do try to interpret images according to certain expectations, and when there's a good chance those expectations may be far from reality it's useful to break them completely. (33,000 kilometers) when its framing camera took these images. After spending more than a month in orbit on the dark side of dwarf planet Ceres, NASA's Dawn spacecraft has captured several views of the sunlit north pole of this intriguing world. These images were taken on April 10 from a distance of 21,000 miles (33,000 kilometers), and they represent the highest-resolution views of Ceres to date. Ceres, with an average diameter of about 590 miles (950 kilometers), is the largest body in the main asteroid belt between Mars and Jupiter. Dawn has been using its ion propulsion system to maneuver to its first science orbit at Ceres, which it will reach on April 23. The spacecraft will remain at a distance of 8,400 miles (13,500 kilometers) from the dwarf planet until May 9. Afterward, it will make its way to lower orbits. This anaglyph of Ceres is part of a sequence of images taken by NASA's Dawn spacecraft April 24 to 26, 2015, from a distance of 8,500 miles (13,500 kilometers). This shows the same view as PIA19319. 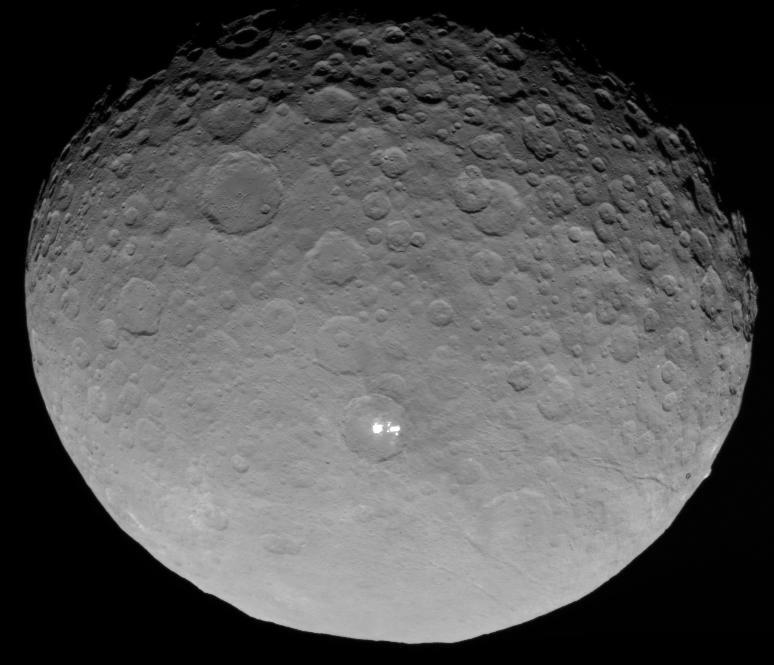 "Dawn scientists can now conclude that the intense brightness of these spots is due to the reflection of sunlight by highly reflective material on the surface, possibly ice," said Christopher Russell, principal investigator for the Dawn mission from the University of California, Los Angeles. None of them have been blurry. They've just been relatively low resolution, so people have been enlarging the images and by doing that it makes them look blurry. Dawn just isn't close enough yet to get those nice close up images. It's not magnification. Magnification is done by lenses. The method of enlarging and interpolating the data digitally is sometimes called magnification because it seems analogous to a real life magnifying glass, but rather than redirecting the light to make the object bigger and details easier to see, digital enlargement has to use interpolation, which just guesses new data into existence. It doesn't actually reveal more detail and has the effect of making the object look blurry. The image you posted was probably originally half that size. geckzilla wrote: It's not magnification. Magnification is done by lenses. The technical term for this sort of "over magnification" is "undersampling". Doesn't some magnification come from the primary objective mirror or lens? When I attach my camera to my 4 inch reflector the view is quite magnified without a lens. Is it just "most" of the magnification come from the lenses? Optics – not my bailiwick. Doesn't some magnification come from the primary objective mirror or lens? When I attach my camera to my 4 inch reflector the view is quite magnified without a lens. Actually, if you attach your camera to the back of your telescope, that optical system isn't even a telescope anymore by the definitions of optics. A telescope is an afocal system: it has an objective and an ocular (eyepiece), and doesn't have any focal plane at all. A collimated input produces a collimated output, and the optical system depends on your eye for focus. The magnification of the system is defined as the focal length of the objective divided by the focal length of the ocular. That value is physically meaningful, in the sense that it means that you actually see the target at (magnification) times larger than you would with the naked eye. When you simply place an image sensor at the focal plane of an objective, you have a focal optical system. You can't see anything with your eye. A collimated input produces an image at the focal plane of the objective, located behind it at a distance specified by its focal length. Magnification isn't well defined, and has little physical meaning. These optical systems are better called "cameras" than "telescopes", and that includes the HST. In the case of both afocal and focal systems, the lenses and/or curved mirrors, bend and focus the incoming light in their own ways. But in an afocal system, the focal plane is in clear space before the eyepiece. In a focal system, the image plane (typically the camera sensor) is placed at the focal plane. For a focal system with a focal length of F, focused on a distant object with an angular diameter alpha, the object appears at the focal plane with a linear diameter which can be stated simply as: F*tan(alpha), or even more simply as F*alpha, assuming alpha is expressed in radians and is no bigger than half a dozen angular Moon diameters (pi/60), say. Wow. Now I know it's not my bailiwick but I think I understand a little of what you're saying. The focal length dictated by the tube length divided by the focal length of the eyepiece (or camera adaptor) is the magnification the eye can sense if it's in correct harmony with the eye lens vs retina focal length. Hopefully I'm getting closer and I do appreciate the insight. This sentence from Wiki's "Optical telescope" under Magnification makes me realize it's not an easy topic to get straight. "Magnification is often misleading as the optical power of the telescope; its characteristic is the most misunderstood term used to describe the observable world." Ron-Astro Pharmacist wrote: Wow. Now I know it's not my bailiwick but I think I understand a little of what you're saying. The focal length dictated by the tube length divided by the focal length of the eyepiece (or camera adaptor) is the magnification the eye can sense if it's in correct harmony with the eye lens vs retina focal length. It's the focal length of the objective divided by the focal length of the eyepiece. The tube length isn't involved. In simple designs, the tube length is often similar to the focal length of the objective, but may be quite different. The magnification isn't related to the optics of your eye. When a telescope is properly focused, your eye is operating exactly the same as when viewing an object at infinity. So the details of the eye don't matter. Look at the Moon, it creates an image of a certain size on your retina. Look at it through a 10X telescope, it creates an image on your retina exactly ten times larger. I wish I hadn't used the term "power" in my earlier post, as it can be very confusing. A 100x magnification can also be referred to correctly as 100x power. But a lens or mirror with a focal length, F, has an optical power (or dioptric power) of 1/F. So, the longer the focal length, the lower the optical power, but the larger the image at the focal plane. And a telescope has a light gathering power proportional to the area (or diameter squared) of the objective.